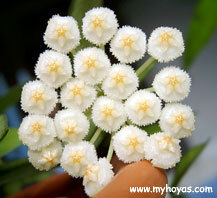 This hoya comes from Indonesia and Malaysia and it was described in 1826. Hoya lacunosa is most suitable for growing hanging. There are many different varieties of Hoya lacunosa, but the most "common" one has leaves that are dark green, 3-6 cm long, 1.5-2.5 cm wide with raised veins and some flecks. It's easy to grow and several cuttings in the pot make a nice big plant really soon. 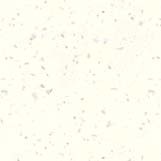 The revolute and fuzzy flowers are cream coloured, almost white, about 8 mm and you'll find 15-25 flowers in each umbel. It's a frequent bloomer once it has started and the perfume like fragrance can fill an entire room at night. The flowers last about 5 days and have no or very little nectar.